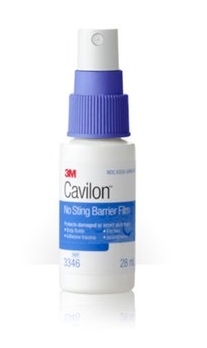 3M Cavilon No Sting Barrier Film Spray is an alcohol-free liquid barrier film that protects intact or damaged skin from bodily fluids, adhesive, friction, and incontinence. Comes in a 28.0mL bottle. Cavilon No Sting Barrier Film will not sting even when applied to damaged or denuded skin. It is completely alcohol free. Clinically proven to provide up-to 72 hours of protection from incontinence for cost effective prevention. It is non-cytotoxic and will not interfere with skin or wound healing and is hypoallergenic. Does not clog or reduce absorbency of diapers or pads. It provides protection from adhesive trauma. I became aware of this product while my dad was in respite care. My father is incontinent and I needed a barrier against his fluids in the event that I didn't change him in time. When I go to change him it is like he was never wet. It is expensive though and the bottle is small (not even 2 oz.). The product came in a big box filled with bubble wrap. It could have been shipped in a MUCH SMALLER box to cut down on shipping costs.